Enrollment trends and topics include analyses related to enrollments, advising, and general education requirements. APIR compiles annual enrollment trend data disaggregated by several topics for the annual Data Digest. Enrollment trends are available between pages 1-17 of the Data Digest, and work files for individual pages are available via the Data Digest web page. Enrollment trends are available on the following topics: student level, gender, race/ethnicity, full-time/part-time status, tuition residency, and age. 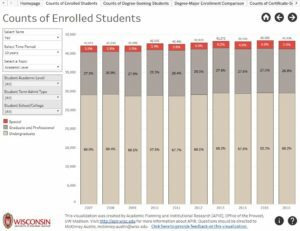 APIR completes analyses related to course size, course and term outcomes, trends of enrollments in courses and majors, and assists with analysis for enrollment planning and forecasting. For term-specific enrollments, please see the Registrar’s Enrollment Reports from the Office of the Registrar. Academic advising issues, including the assignment of advisors, advisor load, and institutional advising strategy, are related to institutional outcomes like retention/graduation, progress to degree, selection and sequencing of courses, and major selection. APIR provides analyses of these advising-related topics because of their connection to institutional strategic initiatives and goals and works closely with the Office of Undergraduate Advising and advising leadership groups. APIR is a member of the campus-wide Undergraduate General Education Committee (UGEC) that reports to the University Academic Planning Council. UGEC conducts assessment activities related to student learning in the five general education competency requirements (Communications A and B, Quantitative Reasoning A and B, Ethnic Studies). APIR works with the UGEC to analyze patterns and trends in how students progress through these general education competencies.